I got three awesome books in my mailbox this week, and I'm so excited for them all! I'm trying to take it easy on new books, as my to-read list is pretty huge at the moment. September is going to be a busy book month, and I have lots to read! 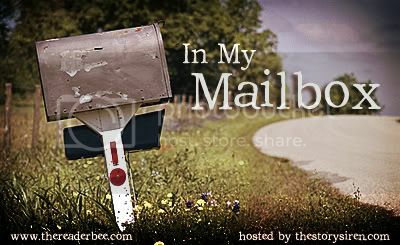 What did you get in your mailbox this week? Leave a link so I can check it out! What a nice selection of titles. I've already read vanish and Sweet Venom. They were both Awesome. Hoping the Pledge is going to be awesome. Old follower. Come visit me over at Livre De Amour-Books of Love Blog. All three books look awesome! I did have The Pledge in ebook, but I decided to wait just because I'm trying to cut down on my ebooks until I get my own ereader. Great IMM! Looking forward to what you think of the Pledge! Hm, I didn't know that was up on Galley Grab. YAY The Pledge (I managed to get the link for that one too). I am excited to see what you think of Sweet Venom. Sept is crazy. I seriously don't think I could review one more book that month, my schedule is packed. Great week for you! Christy, you always clue me into the awesome books available from both NetGalley and Galley Grab! I just downloaded The Pledge. I've been so excited about this book, thanks for letting me know it was there! Vanish!! Sweet Venom!! The Pledge!! So, you don't mind if I just swipe all these, do you? I got The Pledge last week, but not the shiny, pretty ereader which the book so desperately needs because it's not looking so hot sitting on my computer. Vanish has a beautiful cover!!! Oh I want all three!!!! So envious!!! :) Enjoy! Awesome books you got this week. Sweet Venom looks really good. Hope you enjoy reading all your books. AHHH THE PLEDGE!! Lucky you! happy reading! Yay! You got Vanish and Sweet Venom and The Pledge. I LOVED Vanish!! =D Happy reading! I wasn’t too happy with Vanish when I read it but YAY you got Sweet Venom and The Pledge. Two books I really want to read. One because it’s Medusa and the second because its dystopian!! Im somehow holding back from reading The Pledge because I preordered it and want to be surprised! Sweet Venom sounds awesome and I need to get to Firelight! I'm looking forward to The Pledge, hope it's good. Haven't heard of Sweet Venom but I like the cover, I'll go look it up now! I have all three of these and I can't wait to read them (with the exception of Vanish, which I read, and it was SO good). Enjoy your haul, Christy! Sweet Venom looks fantastic. Enjoy your books this week. oh my goodness! So jealous of Sweet Venom, can't wait to see what you think of it! Happy Reading! I just read Vanish last week and I liked it more than I thought it would though not as much as Firelight. I want to read The Pledge and Sweet Venom. I have an overflowing TBR pile that I keep adding to also. I hope you enjoy these! They all sound like great books. I still have to read Firelight and finding the Link for The Pledge took forever. I wonder why it wasn't in the newsletter. Happy reading! Oh my, Vanish AND Sweet Venom? Very jealous! All looks great! I also got The Pledge and can't wait to give it a try! Taking it easy sounds good. I'm spoiling myself with the novels I cannot wait to read from my to-read pile while it's my b-day month, then I will have to take it easy too so I have time for them all! Yay Vanish and Sweet Venom!!! I loved both of those:) And you got The Pledge which I'm dying to read! You had a fantastic week Christy, enjoy those 3! how did you get the pledge seeing it wasn't on the galley grab newsletter??! im dying to read it, great imm!!! Great mailbox! Hope you enjoy...Happy reading! Wonderful books, Christy! I'm so glad you'll get to read Vanish. It got archived on NG before I had the chance to download it. :-( I'll be looking forward to your review! Ooooh! I want to read Vanish too and I find Sweet Venom and The Pledge equally interesting. They're all on my TBR. All books I want to read and none that I have!! Enjoy! Ooh! Sweet Venom!! I can't wait to read that one! And I got The Pledge, too! Totally forgot to add it to my IMM, lol. Nice selction of books! I want to read The Pledge so bad! The Pledge.....I haven't been able to get a link of that one but I want it SO bad. I love her Body Finder series!!! Can't wait to see what you think of Sweet Venom! 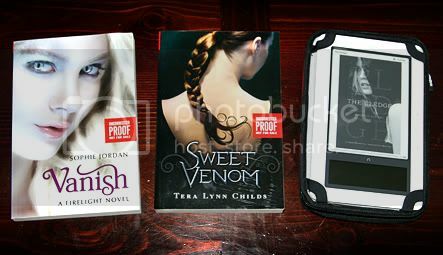 Sweet Venom and The Pledge are on my wish list! I am so jealous that you got Sweet Venom! I am so excited for that book! Lucky you!